A friendly handshake and a large smile set the tone for a new adventure, breaking the cloudy weather and the rainy mood with the positive vibration of optimism. I have O. by my side, a genuine tourist and a charming French woman with an overflowing refinement, in front of who any gloomy hint on my face dodges, clearly affected by the early waking in the morning, in combination with the gray tones of the weather. It was not the first city break in Iasi, but this time it was fair to call it my first “séjour en ville”. I started walking with shriveled steps, and with my hands clutching the umbrella, alongside cheerful O. She seemed to carry a bit of the French sun. Her attitude reminded me of a famous slogan: “London. Rain. Strong wind. Hairstyle lasts.”Only that in this context, what was lasting was the enthusiasm in our historical Iasi. But there is a Romanian saying that sounds like this: “After work and reward.” And because in the cultural capital of Moldova we respect traditions, behold, I was rewarded for my good behavior as a guide and host (qualities recognized by O.; far from me the self-praise, holy deity and dear reader). Arriving in front of the Metropolitan Cathedral, fresh rays of sun scattered the clouds, illuminating the entrance to the holy shrine. A gentle glow warmed our heart, charging us with the spirituality and beauty of this place blessed by God. The solemnity of the church was interweaving with the fragrance of warm silence. Once we stepped inside the church a sweet piety embraced us, one that, although being inspired by the mysterious decor felt as if it was springing up within us. A large room in whose heights seemed to float strong prayers, seeking the way to the Heavenly Father, placed in timelessness the union of the earthly with the divinity. Man is as small as grain of sand in the wide desert, and the holiness of this place was reflecting in our consciousness humble human condition, so frail and thirsty for love and Fathers blessing. The Metropolitan Cathedral of Moldova and Bucovina is one of the six Orthodox Metropolitan Cathedrals in Romania, which is today a historical monument, thanks to the efforts of the Metropolitan Veniamin Costachi, who laid the foundation stone of this church. In the place where it was built there were two older churches, the White Church and Stretenia Church of the XVth century, respectively XVIIth century. Although the Metropolitan Cathedral was founded in 1833, the work being continued by the architects Gustav Freywald, Bucher and Michael Singurov until 23 May, 1839, in 1857 occurred the collapse of the central canopy, which caused the church two decades of precarious state. In 1887 the cathedral finally knew a thriving period to the joy of the whole Orthodox nation, which on April 23, along with the royal family, celebrated the dedication of this monument church. The first king of Romania, Carol I, made donations of hearty gratitude for the valuable significance of Iasi city, which he used to refer to as “my second capital”. 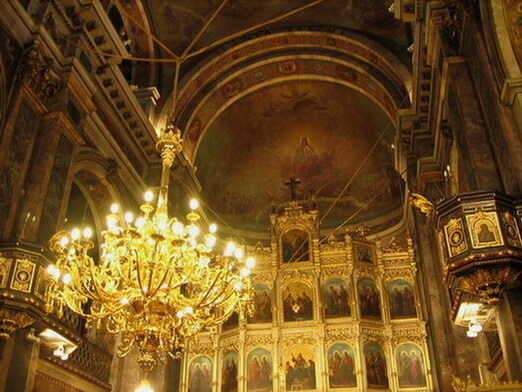 Being connected to the name of the royal house, the holy metropolitan cathedral increases its beauty through a decor given by artistic ornaments bearing the fingerprint of the painter George Tattarescu. The influence of Renaissance respects the canons Erminiei Orthodox traits of Western painting, combining the spirituality of the church painting in Romania on the 19th century with the Italian neoclassicism whose rigor has been known by the artist in the years of study spent at Academia di San Luca in Rome. Beyond the precious architecture, the essence of religion is kept scrupulously in the heart of the cathedral, preserving firm the walls of Christianity. A blessed year was 1889 when a genuine shred of holiness was brought to rest in eternity alongside the relics of the great Metropolitan priest of Moldova and Suceava, Veniamin Costache. The venerable relics of Saint Parascheva were brought from Three Hierarchs Church, keeping the church in infinite sacredness. Since then, the Metropolitan Cathedral has three big celebrations: Candlemas on February 2, Great Martyr George on April 23, and Saint Parascheva on October 14. The church was not enriched by holy celebrations only, but by a continuous stream of believers who have been coming to venerate the saints and to uninterruptedly watch over the relics of St. Parascheva. Also this time people were waiting in a long queue beside the relics, drawing the attention of my friend O., who found interesting, to say the least, the habit of keeping the saint in a coffin like that. People were praying with reverence, forming a spiritual painting with their whispered prayers. A touch of holiness filled our senses, so far detached from worldly things, and anchored in a spiritual mood. 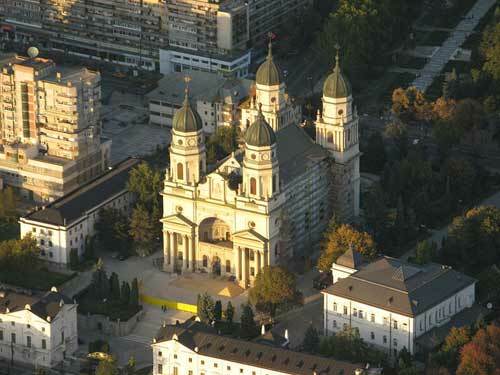 The Metropolitan Cathedral in Iasi, a pearl of Orthodoxy, embraces faith woven into a genuine Eden which lasts in history as the city of souls.